A 1998 Chevy Cavalier "Pats-mobile" is being sold on Craigslist in Connecticut. 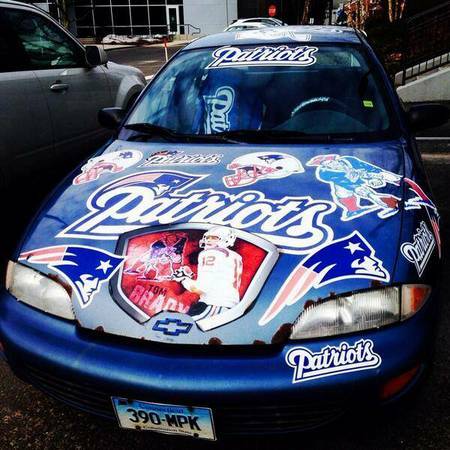 Are you a diehard New England Patriots fan and in the market for a new car? Perhaps you'd be interested in this "state of the art Pats-mobile," which is being sold for $1,000 on the New Haven, Conn., Craigslist. As you can see, and in the seller's own words, the car "is covered from hood to trunk in stickers featuring the New England Patriots. Tom Brady, old-school logo, newer logo, helmet and more." It's a 1998 Chevy Cavalier, and the drawbacks are that it has a leaky radiator and has logged over 250,000 miles. But if you're willing to overlook that, you'd be hard pressed to find a cooler car pulling into Gillette Stadium next season.